As many of you may know, we'd hoped to have Ephemeris out by WorldCon, but we obviously missed that goal. I've made tremendous progress on the initial rules over the last couple of weeks, and we're now hoping for a release date sometime around MileHiCon. Granted, life often gets in the way, so it could still be early next year...but we're really shooting for late October. Having just completed the most recent round of revisions on what I'd hoped would be my next novel, I have to admit that disappointed isn't even the right word. Even though I did add a lot, I also cut out some stuff that didn't seem to be working. As a result, I fell well short of the 80,000 words I was shooting for. I'm sure that even if I have people read it before I actually start to submit it, they aren't going to find enough places to add the kind of wordage that I would need...so it looks like I'm stuck with a novella. Now I just have to figure out where I can actually submit a novella...yeah, more than a little disappointed. 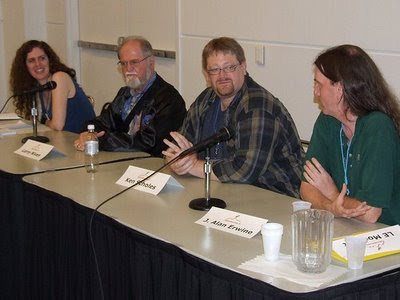 Here are some pics from my panel with Larry Niven at Denvention...the World Science Fiction Convention. These are from the collection of pics that have been put together by the Con. To see all of the pictures, please go to...http://www.flickr.com/photos/arwensouth/collections/72157606586226770. Today was the last day of WorldCon. I made it down early enough to catch a panel called Making a Living Telling Lies. The panelists were Bill Mayhew, Connie Willis, Jay Lake, and Jo Walton. I figured it would be a good panel because putting Connie and Jay together is bound to spark something interesting, and I wasn't disappointed. I don't know if I necessarily learned anything, but I was definitely entertained. After that, I just wondered around talking to people about whatever we felt like talking about. I handed out a lot of my cards, which will hopefully lead to some sales for me, Sam's Dot Publishing, and The Genre Mall. There were a few people I'd met in the past that I was hoping to get a chance to talk to, but it didn't work out. I never did see Maggie Bonham, and I passed Mike Brotherton and Frank Wu a couple of times...but they were always quite busy. I was also hoping to meet Lawrence Schoen who I've edited in the past, but I've never met in person. I saw him once in the hall, and he was on a cellphone, so I never had a chance to introduce myself. I was also hoping to meet Bryan Thao Worra, but I don't think he even made it. After the morning panel, I was hoping to introduce myself to Jay Lake, but he had to leave before the panel was over...so I never had the chance. I also wanted to meet John Scalzi, but other than when he won the Hugo, I only saw him when I was in line for registration...and he was with a big crowd, so I didn't want to push my way in. I find it so rude when people interrupt my conversations, and I'm sure it happens a lot more to him. I also went to the closing ceremonies, which had some good moments. At the end of it all, it was kind of sad. This was my first ever WorldCon, and I didn't get to see as much as I wanted. Had it been for any reason other than family, I would have been very frustrated...but I can't complain about missing a Con because I have kids to take care of. They're good kids, and I certainly want to be there for them. I'd love to think that I'll make it next year to Montreal, but I kind of doubt it. Australia also seems pretty unlikely...but maybe I'd better get back to writing so that I have even more reason to go to WorldCons in the future. I'll try to find some pictures to post tomorrow! Day 3 was pretty much a bust for me. Because of daycare issues, I was only able to make it to the masquerade...which really wasn't as impressive as I thought it would be. There were definitely some great costumes, but I expected a lot more from a WorldCon. Still, it was worth it just to see Frank Wu's costume. You can find it here. Day 4 was good. I got there at a fairly decent time and spent a lot of time reacquainting myself with a lot of people. 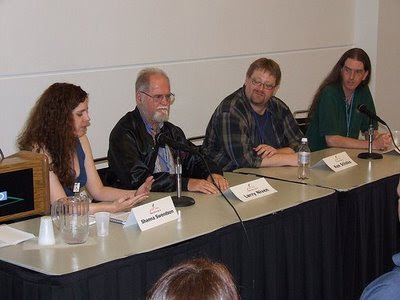 The first panel I went to was about the evolution of SF, which had quite an impressive list of panelists: Ben Bova, John Stith, LE Modesitt, Robert J. Sawyer, and Shoshana Glick. It was interesting to hear what people from across the generations of SF had to say. After that, I went to a panel on self-promotion, which really didn't teach me anything I didn't already know. Then it was off to dinner with Hobbit and talking to more people along the way. The night ended with the Hugos. I don't usually like award shows on TV, but the Hugos were fun...and I still think it would be great to stand on that stage holding one of those statues. I guess I'd better work on getting much better at what I do as a writer and an editor. Now, it's time to get ready for the final day. I mostly want to go down and meet some people I haven't met...except on-line. That's my main goal for the day. This is my first ever WorldCon, and to be totally honest...I haven't been there much. Now that I've suddenly become a dad, I've had familial obligations. I got there Wednesday around 11 with the intent of hitting a couple of early panels...instead I stood in line at registration for about an hour. There were definitely some glitches. After that, I hit the Dealers' Room...lucky I don't have any money. Along the way, I ran into Ian Brazee-Cannon, Laura Givens, Cynthia Felice, Rebecca Bates...and waved at a lot of other people I knew...all of whom seemed to be on their cellphones...I'm beginning to wonder if there was some kind of conspiracy. I also saw a lot of the big hitters, but they were talking with other people, and I don't think there's anything more obnoxious than people interrupting a conversation. I made it to two panels yesterday. The first was an art panel, which I didn't think went very well because the moderator did most of the talking. After that, I went to a panel on the small press...which didn't really hold any surprises for me, since I've been in the small press for so long. I then went to the Opening Ceremonies, which I also thought were a major downer. That was it for the first day, and even though it might sound like it wasn't a great experience, I had a lot of fun talking to people...and that's what Cons are really about for me. Thursday was going to be a nightmare. I had a panel and a signing...the only programming I'm doing at this year's Con, but we couldn't find any daycare...at all! Luckily, I have the most amazing fiancee in the world, and she was able to rearrange her schedule at work. She went in and opened...came home so I could make my panel and signing...and then went back to work to close. Did I tell you she's amazing??? The panel was What Makes SF Work? Characters, Society, or Technology? 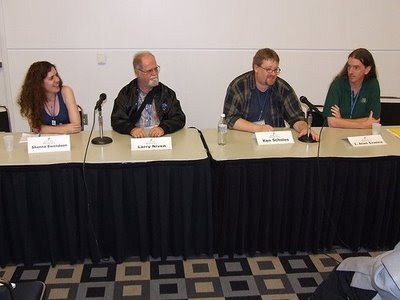 My co-panelists were the one and only Larry Niven, Ken Scholes, and Shanna Swendson. The panel was a really good time. I'd guess that we probably had 50-70 people in the audience...and yeah, I really believe they came to see me (that's sarcasm, by the way.) Even though we all agreed that the answer to the question was "yes," we managed to stretch it out to the full 75 minutes, with each of us getting plenty of time to talk. It was also nice that the four of us were different types of writers, so I think the audience got a good variety in the answers. And we had a good audience too...with no one trying to talk too much. After that, I had my signing, which was a complete bust. Most conventions put the signing close to the entrance of the dealers' room, but Denvention had us set off to the side. So the only way someone would have noticed me is if they actually came looking for me. But I did run into Rose Beetem and Ron and Nina Else...all very nice people. The one nice thing about the signing was that I was sitting right next to Stanley Schmidt of Analog. It was fun to kind of pick his brain a little. I know I won't shut up about WorldCon, but I'm excited. This will be the first WorldCon I've ever attended, and the fact that I get to do a panel and a signing makes it that much more exciting...assuming we can find daycare for the little ones. So, if you're interested in reading my bio, you can find it at http://www.denvention.org/programming/bios22.php#JAlanErwine.